The 13th formal meeting was spurred by opportunity. Rosário Durão was passing through Portugal, and the date suddenly emerged as the only option to hear her in Lisbon. 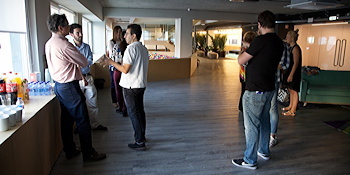 Farfetch accepted to host an evening meetup in the new Lisbon office, but required one of the speakers to be from Farfetch itself, which means that Joaquim had to be the second speaker. The earliest participants arrived at 18h30, so that they had time to tour the amazing views from the terrace. Most of the participants entered the building through the wrong door, managed to go up to the second or third floor, and got quite confused in front of closed doors. Frantic phone calls ensued. Ultimately people had to go back to the street and enter the building through the correct door. All this activity made the first presentation start at 19h30. Joaquim presented his recent experience and opinions on AsciidocFX, a freeware editor that provides good facilities to take structured notes. AsciidocFX customizes the well-known Atom editor to handle AsciiDoc, a plain text format that is much better than Markdown but still weaker than ReStructured Text. AsciiDoc is readily extensible, and seamlessly incorporates PlantUML drawings, for example. AsciidocFX deploys everything needed to convert the text and diagrams into PDF, HTML, and ePub books. The typography is good enough to use without special configuration. Writers can quickly draft documents combining both text and technical diagrams. However, both the AsciidocFX editor and the Asciidoctor parser have their own flaws. These flaws prevent their adoption as a backbone for serious technical writing. Joaquim is moving the Farfetch infrastructure to DITA, but AsciidocFX earned its place as a technical scratchpad. Shortly after 20h, the audience encouraged Rosário to innovate by presenting in English over slides in Portuguese. She explained the principles of crisis communication, which requires both planning and courage. Crisis communication must involve the public, establish credibility, and contribute to overcome the crisis. The planning phase forces the company to identify its operating risks. Accepting and dealing with the operating risks helps to create a safe environment that is a prerequisite for innovation, especially in large companies where internal politics can easily hinder change. The presentation ended with an open conversation where the audience considered how the principles applied to their own companies. Daniel has been a speaker at Technical Writing meetings since the very beginning, so when he started to take AcroYoga seriously it felt very natural to ask for a demonstration. Daniel and Laura had been warming up during the presentations, in a space behind the audience. Shortly before 21h, we joined them for the demonstration. After a short introduction, Daniel and Laura demonstrated the strength and equilibrium required in AcroYoga. More importantly, they explained how the two partners communicate with sight and motion. AcroYoga requires trusting others physically, which can be quite difficult for some people. AcroYoga can be used to teach trust. Daniel and Laura demonstrated that trust with another Laura, which was asked to let herself became a pendulum among them. Daniel proceeded to challenge another audience member into a more acrobatic exercise. The demonstration ended with the lunar part of AcroYoga, where one of the partners cares for the body of the other, which assumes a more passive posture. It became beautifully clear how AcroYoga fosters intimacy between trusting partners. Farfetch offered pizza and drinks, which was a novelty at Technical Writer meetups. Pizza made people stick around for an extended networking period of about one hour. People talked and experienced some of the amenities in the new office, including the suspended chair and the signature ball pool renowned for freeing the inner child inside grown ups. Usually all participants receive a paper questionary, but not this time. It was not before the end of the meeting that dawned on me that I had completely forgotten to bring and distribute the public notes forms. I asked for feedback through email. Rosário had promised to raffle one free registration for her upcoming trainings in Portugal, but AcroYoga and Pizza apparently made us forget. Later I collected the names of the participants, and Rosário drew two names: Marco Correia and Ana Pinto. Special thanks to Rosário for once again sharing her knowledge in Lisbon, to Farfetch for hosting the meetup, and to Andreia, Cristina, and Luís for handling all the logistical details. We are excited to announce our 13th formal meeting, sponsored by Farfetch. Thursday, May 25th, 19h00–22h00 (come early). Rua do Instituto Industrial 7 – 3rd floor, 1200-225 Lisboa (a 10m walk from Cais do Sodré). You will have to identify yourself to the security guard on the ground floor. Come see Farfetch’s new Lisbon office, learn from your fellow speakers, and network over pizza! Joaquim shows how the editor AsciidocFX turns the plain text format Asciidoc into an insightful drafting tool, even if Asciidoc falls short as a production writing tool. Rosário shows how risk and crisis communication leads companies to identify and deal with their business risks. Managing risk creates a safe environment that is a prerequisite for innovation, especially in large companies. Daniel and Laura demonstrate their passion for AcroYoga, where movement and play elevates the connection between practitioners to new levels of union and trust. The participation is free, but subject to room capacity. Please reserve your place at Meetup.com. Feel free to extend this invitation to friends and other interested parties. More interesting participants will improve the learning experience for everyone. Thanks to our sponsors for all the support: Farfetch (room and coffee-break), APCOMTEC (marketing) and EuroSIGDOC (site). PPS: Rosário Durão will offer one free registration for her upcoming trainings in Portugal. See DesignThynk.com for details. The 13th Report — 22-page report of the meeting, including the slides of the presentations.